On the death of his father, John Bradshaw became Lord of the Manor at the age of fifty two. In 1666, the year of his succession, the new Hearth Tax records show that the whole Township contained a total of 38 hearths whilst Bradshaw Hall itself had 13 of these. We can see that there can still be no more and probably less than twenty five other houses or farms in the Township in that period. It would seem by what follows that the continuing Non-Conformist life led by his father could in the early Restoration years have continued to affect the family fortune. The old man seems to have been very much a patriarchal figure and possibly domineering, while the new Lord of the Manor seems to have been relatively insecure. 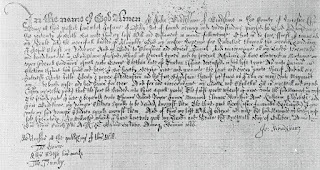 For, on the 18th October 1666, nine months after his inheritance, John Bradshaw completed an Indenture with James Chetham Esquire of Turton (Lord of the Manor of Turton, son of George, and great-nephew of Humphrey Chetham, who purchased Turton Tower in 1626), in which he confirms a Mortgage of part of his Estate in order to secure £600 for the upbringing and education of his younger children (then eleven in number). The properties involved were Bradshaw Hall and demesne lands; the water corn mill; Walch Fold; Brookbottom; the New Barn (Meadow Barn) and a dwelling house in Bolton. Margaret my wyfe, the second parte I give and bequeath unto Thomas Robert Roger James Margaret Eleanor Dorrathie Anne Katherin Elizabeth and Jane Bradshaw my younger children equally to be divided amongst them. The third part hereof (after funeralle discharged) I give unto my said younger Children equally amongst them. And of this my last Will I ordeyne and make the said Margaret my loving wyfe sole executrix. In witness whereof I have hereunto putt my hande and seale the nyneteenth day of October 1666. This reference to George Chetham must apply to a previous mortgage confirmed by the Indenture to George Chetham’s son James in October 1666. John Bradshaw had, of course, previously sold the Brown Barn property to George Chetham in 1655. The Will suggests that John Bradshaw was suffering ill health and expecting death at the age of 52, but in fact he lived on to make a further Will in 1693. John married Margaret the eldest daughter of John Atherton Esquire of Atherton and their son and heir John was born on 1st May 1646. Their marriage was fruitful but blessed with eight girls, for whom he was obviously worried regarding both education and marriage settlements; the latter probably contributing further towards the financial rundown of the family estate. An Indenture of 24th February 1668, is the subject of a claim, a counter-claim, and finally arbitration of the coal mining rights of John Bradshaw's lands in Tottington - these would be the three farms on the Tottington side of Watling Street near Affetside (Harworths, Yeomans and Holts). It is perhaps a reflection on the Bradshaws declining power and influence in the area when a matter of this sort was adjudged by an outside authority. As with most arbitrations of today, a compromise was eventually determined. The pattern of centuries continued regardless of the problems facing the Lord of the Manor. The Township was still owned by the Lord and leased to his tenants, apart from the Birches farm, the leasehold of which was held with the Quarlton estates by the Barton family of Smithills, having inherited these through marriage to the Radcliffes and the leasehold of the Brown Barn property held by the Chethams of Turton. John Bradshaw also held land in Harwood (adjacent to Brookbottom) and Tottington (referred to above). The Poll Tax record of 1678 for Bradshaw Township shows there were 25 families thought fit to pay poll money which at one shilling per head totalled £2.9s.0d. Harwood, however, which was not by this time a Manor estate and hence capable of more growth and freedom to move and buy property had 51 families paying Poll Tax totalling £6.5s.0d. Perhaps the ill fortunes of the Bradshaw family were rubbing off on to their tenants! John Bradshaw, once again finding himself ‘infirme in body, but of a good and perfect memory and having a disposing faculty - thanks be to God’, made his last Will on 15th March 1693. This last Will refers to a Trust Deed set up during the previous May 1692, whereby Henry Wrigley of Langley, Thomas Bradshaw of Lumb and John Jenkinson of Fealsworth were appointed trustees to act on behalf of his family. These trustees were to ensure that funds were raised by mortgage or sale to satisfy the legacies that John Bradshaw had specified. This required sums of money to be assured for the younger children before the remainder of the estate was devised to John the heir, and so on to his heirs. Sometime between 1666 and 1692, after the death of his first wife Margaret, John Bradshaw senior married Suzanna who was named sole executrix of her husband’s latest Will. In this last Will, John Bradshaw confirms his previous Trust Deed requirements, but makes two specific modifications. The first was that if his daughter Eleanor should marry a certain Peter Heywood of Manchester, her marriage portion should be reduced from £200 to £100 ‘and no more’. The second modification was that the Trustees were empowered to raise and spend money to prevent son John raising legal objections by way of a suit against the conditions of the Will. It was apparent that this was not a ‘happy family’, and to ensure his will was done, John Bradshaw Senior entered into a legal contract for the sale of the remainder of his Estate and Lordship to Henry Bradshaw of Marple Hall on 27th March 1694. The sale was to be completed within six months and ‘included the Coat of Arms of John Bradshaw the father and the son and liberty to quarter the same with the said Henry Bradshaw's own Coat of Arms’. The agreed selling price was £4000. This inclusion of the Arms strongly suggests that Henry Bradshaw had an ambition to own the Lordship from which his own branch of the family had originated, but had left centuries earlier, to settle first in Derbyshire and then in Cheshire. John Bradshaw Senior was the last of this ancient family to die in the ancestral home and was buried in Bolton Church on 30th March 1694. 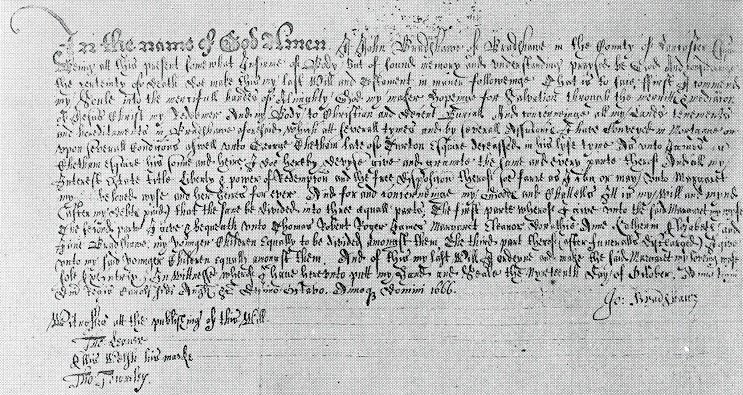 We can find no record of what actually happened to the Mortgage Deed of 1666, but by the time of John Bradshaw's death, the land and farms of Walch Fold, as well as Brown Barn, were under the ownership of the Chethan’s and their heirs – presumably as settlement of the mortgage debt. This was only the second disposal of land from the Manor of Bradshaw since the settlement of the Birches Farm with the Radcliffe family, in the fourteenth century. The actual Indenture of Sale, mentioned as a contract in the Will, was dated 25th June 1694, three months after the father's death. The Indenture was between John Bradshaw son and heir, Susan Bradshaw widow, Thomas Bradshaw of Haslingden, Henry Wrigley of Langley and John Jenkinson of Lyme on the one part, and Henry Bradshaw of Marple. By this time the sum agreed was £3960, to be paid in instalments. The first £600 on completion of the Indenture, £600 on 27th March 1695, and annual payments made on 27th March of each year to 1701, with interest of 5% per annum payable after the first two payments. All the payments were to be made at the dwelling house of Thomas Mercer in Manchester, Inn Keeper. The total sum payable over the seven year period including interest was £4463, for which Henry Bradshaw of Marple purchased the Manor and Lordship of Bradshaw, Bradshaw Hall and demesne lands, the water corn mill and kiln, all mining, quarrying and tithe rights, ‘interest of in and to a certain Chapel called Bradshaw Chapel and of in and to all the seats and forms therein and thereto belonging’. The purchase included all farms and cottages in the several tenures of Thomas Hamer, John Wallworth, Edward Bridge, John Hamer Senior, George Bradshaw, Thomas Bridge, John Harmer Junior, John Bradshaw of Affetside, Widow Greenhalgh, John Welch, John Brooks, John Bradshaw of Brookbottom, John Wood, Ralph Tong, Robert Farnworth, Hugh Bradshaw, James Ramsden, Thomas Settle, John Lomax, Alexander Bradshaw and John Nuttall. These included 300 acres of land, 20 acres of wood, 100 acres of meadow, 100 acres of pasture and 100 acres of furzes and heath, mainly in Bradshaw, but a small acreage in Harwood and three farms in Tottington (Affetside). It was agreed that the Bradshaw family could remain at the Hall until 2nd February 1695, and then depart. The son and heir John Bradshaw was in his 48th year when he inherited the estate and was the Lord of the Manor for less than three months. John subsequently married the daughter of a Chester shopkeeper named Gregge, and apparently had no children. Of the other members of the main branch of the Bradshaw family we know nothing, but we may assume that they left our district for good. Other branches of the Bradshaw family, however, continued to live in the district perpetuating the name to our present day.